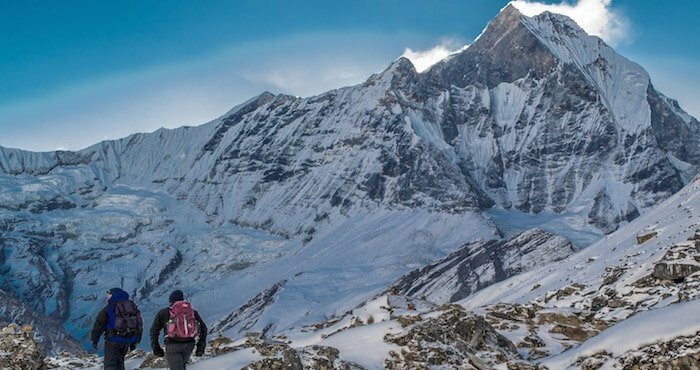 For many people deciding on a trek or adventure holiday to Nepal and other mountainous regions, consideration about how our bodies will react to higher altitudes is a factor. Altitude sickness isn’t something you need to worry about if you take the necessary precautions. Our bodies are excellent at working in “normal conditions.” The good news is that we’re also extremely adept to adapting to changes in our environment, such as an increase in altitude. There is a minefield of advice available, though it can be daunting to decipher the information. We’ve created a small guide to give you the most essential information in a clear, concise manner.  It is very simple to prevent altitude sickness affecting you if you follow this advice. Dehydration and altitude sickness go hand in hand. Drink two litres of water before lunch and two litres after lunch every day above 3000m. Other liquids count. Hot lemon cordial is a readily available favourite on our Nepalese expeditions and contains much-needed calories and energy. Above 3000 meters you should avoid alcohol whilst ascending. One beer in the evening is fine (if you are feeling okay) but more than that will dehydrate you. When you start to descend from your high point you can celebrate with a few drinks if you are feeling fit and well. You need energy to sustain yourself for big days. If you start to tire then you are more likely to feel the effects of altitude. Eat as many different nutrients as you can. Enjoy the abundance of fresh vegetables, fruit, honey and chocolate. You can eat as much food as you like and not feel bad about doing so. All of our itineraries are designed with the best acclimatisation strategy for the route. We will have acclimatisation or rest days planned if necessary and we will never sleep too high above our last night’s sleeping place. This is because we want to ascend as comfortably as possible giving our bodies plenty of time to adapt to the thinner air by producing more red blood cells. People of all ages and abilities should have no problem with the height gain on our trips each day. It is all right to lie down but you must keep the mind working and eyes open (i.e. reading a book) during the hours you are normally awake for. Messing up your body clock is not very good for acclimatising and can make you feel very groggy. It is normal to feel a little bit dizzy, nauseous or have a headache. Your body is running on less oxygen than normal and you will feel a bit weird to how you normally are. In addition to the altitude, you’ll be eating foods that you may not be used to. This is not a cause for concern and our advice is to not worry about it and relax, but listen to your body. If the headache starts getting unbearable or increases, or your walking turns into a stumble then you need to stop, don’t go any higher and if symptoms worsen then you need to retreat to a lower altitude. If you are getting out of breath you are walking or cycling too quickly. All of our treks and expeditions have plenty of staff so we can split the group during the day to cope with different walking or riding speeds. You will never be made to walk or cycle faster than you are comfortable with. It’s advisable to wear long sleeves and trousers and cover any exposed skin with sun cream. The sun is very powerful the closer you are to it and can even burn through cloud cover. The sun can burn you quickly leaving you dehydrated and more susceptible to altitude sickness. All of our guides have spent many years leading groups at high altitude and are well equipped to deal with any problems. All of our porters and support staff have excellent equipment for travel into the mountains. Your trip leader will be paying careful attention to all clients and staff, making sure everyone stays as comfortable as possible and has the best chance of attaining goals and completing the trip. If all the above points are adhered to the next battle may be psychological. If you look after yourself and your feeling fit and happy then you need to keep telling yourself you can do it. Keeping your mind strong is a good tool to success. There is no need to take Diamox unless you are starting to show signs of Acute Mountain Sickness (AMS) and you have a bad headache. You need to have tested Diamox back in your home country first to see if you are allergic. After taking Diamox to cure your symptoms you must not climb any higher as it is simply helping you deal with problems, not making the problems go away. When using as a prophylactic our testing has seen no increase in ability to cope with altitude. Ask your doctor to prescribe you Diamox and explain that you want to have it for emergencies only and that you want to test to see if you are allergic to it first. Most doctors will give it to you if you explain this. 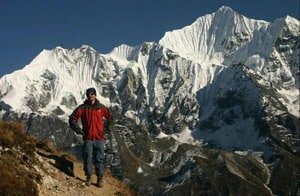 Richard Goodey wrote this advice and has lead hundreds of people on high altitude treks in the Himalaya for more than 15 years. 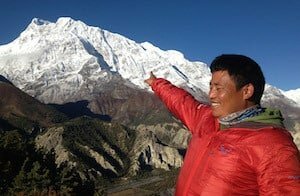 He has climbed at altitude all over the world and spends 5 months of the year in Nepal training guides and leading groups. If you would like to read more in-depth research about how altitude affects the body please download this altitude advice booklet. Read more about our treks and multi-activity holidays to Nepal.